For me the first blooms of the Helleborus, commonly known as Lenten Rose, signal the beginning of a new gardening season. As the snow starts to melt I can't resist poking around in the old foliage looking for the tightly furled blooms that will quickly emerge with the warmth of the early spring sun. For years it was commonly believed that there was no point planting Hellebores in the Ottawa Valley because they would not survive. Every April when I went to Southern Ontario on buying trips I was enchanted by their beautiful flowers. I finally decided that the worst could happen is that the plant would die so I bought one and planted it in a sheltered part of the shade garden. Now our property contains at least fifty clumps of Hellebores. Some of the first ones I planted have made large clumps with all the seedlings that have matured around them and are producing over one hundred blooms from the investment in just one plant. 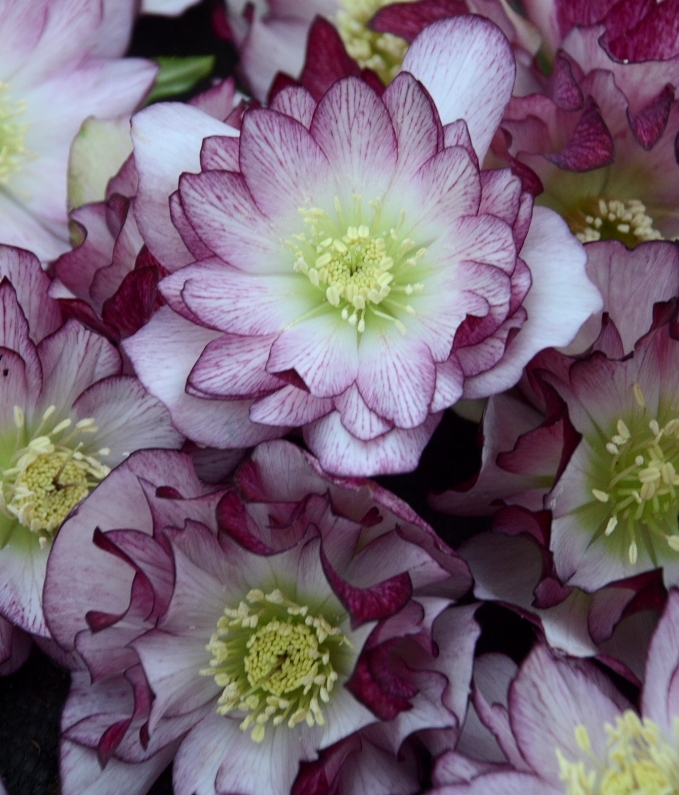 Over the last twenty years plant breeders have introduced more and more Helleborus varieties giving gardeners a fantastic choice of colours from white and pastel to almost black and complex flower shapes including fully double blooms. After flowering the deeply divided, leathery foliage of Hellebores remains a lush green and provides a beautiful contrast to the more rounded leaves of hostas and other broad leaved shade plants. Hellebores are native to woodlands and rocky sites across central Europe to western Asia. In medieval times they were believed to have magical powers and offer protection against evil spirits. Clumps of them were planted close to the entrances to cottages and animals were decorated with garlands of blooms to keep them safe from disease. The name Hellebore comes from the Greek hellein (to kill) and bora (food) an acknowledgement of their toxic effect. Hellebores are very long lived and will frequently produce masses of seedlings under the skirt of their foliage that can be transplanted to start new colonies. They are seldom bothered by any disease or insects and are also not favoured by deer The blooms last for several months as they transition from coloured petals to papery bracts with attractive star shaped seed pods. Hellebores do best in a part shade location with either morning or late afternoons sun. Soil that is suited to woodland plants with lots of organic material and good drainage is ideal. They like consistent moisture in the spring and fall when they are actively growing but dryness in late summer when they are resting will not bother them. I like to wait until the blooms are starting to unfurl and new leaves are appearing before cutting back any foliage that has been damaged over the winter. In years when snow cover has been scarce the evergreen leaves may all need to be removed but the lush new growth will replace the damaged leaves. A five centimetre mulch of organic material like rotted leaves or aged manure applied every spring will keep the clumps growing well. Hellebores resent disturbance and can remain in the same place for many years. Propagation from self sown seedlings is the easiest way to obtain more plants but the fearless gardener may decide to cut into an established clump and pull apart divisions to replant. We have been most successful moving and dividing Hellebores in late summer just as they begin a new flush of growth. In the fall we allow the fallen leaves to stay on the ground to protect the crowns of the plants. If you want to clean up the garden in the fall some evergreen boughs over the plants will trap the snow and provide extra protection especially for new plants. Over the last ten years intensive plant breeding using Helleborus Niger, commonly known as the Christmas Rose, and H. orientalis with its coloured flowers has produced exquisite double flowered forms and interesting marbling in the foliage. Flowers have also become more upfacing allowing gardeners to see the full bloom not the hanging bells that are typical of the older varieties. I am so glad that I ignored the advice to give these beautiful harbingers of spring a wide berth because they have proven to be some of the easiest to grow and longest lived plants in our shade garden. I would never want to be without them.